Researchers say stereotypes of what older people should be, known as prescriptive stereotypes, center on three key issues. Select the thought bubbles in the illustration below to learn more about each of these issues. Michael North, a fifth-year graduate student in psychology at Princeton University, knew he was lucky to land a summer research position at the University of Michigan after he finished his bachelor's degree there in 2006. His task: Sit in a lab for two hours at a time and interview local residents—young and old—for a study on wisdom. "When the professor told me this, I nodded and said OK, but as a 22-year-old kid I wasn't really excited about sitting in a basement interviewing old people, as I saw them," North said. "I thought they would be really boring. I thought they would smell. I thought they would make me feel weird. These were the thoughts I had, honestly." But the reality was different. North found that he enjoyed interacting with the older group more than the younger people. "The older people were the ones who showed more interest in the project, they showed more interest in me personally and asked more interesting questions," North said. "In other words, the people society now considers older and irrelevant are about to become far more common and visible—perhaps more so than ever in modern society," the researchers wrote. "It's not hard to read The New York Times or The Wall Street Journal and see that as the baby boomers are getting older, age-discrimination cases are on the rise and worries are growing about the long-term sustainability of Social Security and Medicare," North said. "The academic literature hasn't really spoken to these questions." The research by North and Fiske homes in on the idea that understanding intergenerational tension is key to understanding ageism. Ageism is the one kind of discrimination, North noted, in which those who are generally doing the discriminating—younger generations—will eventually become part of the targeted demographic. "Ageism is a topic that touches on many sensitive areas, including older adults themselves, family members, policymakers and the media," she said. "North and Fiske unpack the stereotypes toward older adults and show how these stereotypes vary in their causes and effects." Fiske, a social psychologist, joined the Princeton faculty in 2000. Her most recent book is "Envy Up, Scorn Down: How Status Divides Us" (2012). The research she and North have conducted expands her far-reaching work on stereotypes. "We have found a variety of evidence, over the past dozen years, that people make sense of each other along two primary and apparently universal dimensions," Fiske said. "The first is warmth—does the other have good intentions, is that person trustworthy and sociable. The second dimension is competence—can the other enact those intentions. Stereotypically, the middle class are both warm and competent, rich people are cold but competent, homeless people are neither. 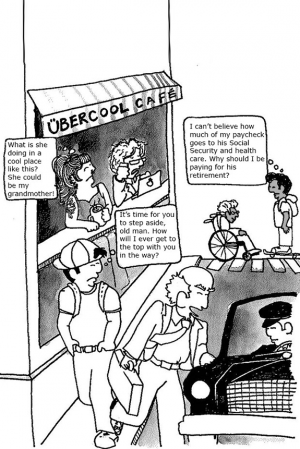 The default stereotype for older people is well-intentioned (warm) but incompetent." The researchers focus on ageism that is based on what psychologists call prescriptive prejudice. "Instead of describing what old people supposedly are in reality, it 'prescribes' what others think old people should be," Fiske said. "Older people who 'violate' these 'prescriptions' are punished by those who discriminate against them; older people who adhere to them are rewarded with sympathy and pity." Consumption, the idea that older people shouldn't consume so many scarce resources such as health care. In a January article in Social Issues and Policy Review, Fiske and North focused on the dangers of lumping together all older people, starting as young as ages 50 or 55. Instead, North and Fiske argue that the "young-old"—generally those still working and in relatively good health—should be considered separately from the "old-old"—generally older people who no longer work and are in poor health. "Though numerical age is a useful indicator, it is an imprecise one when it comes to distribution of societal resources," the researchers wrote. "Age-related characteristics are evolving all the time, but social policies seem stuck in the past, uncertain how to accommodate shifting age dynamics (as evidenced by impending Social Security and Medicare crises)." Further advancing their work, North and Fiske have conducted experiments that helped shape a scale for measuring ageism that is described in a paper accepted for publication in the journal Psychological Assessment. The Succession, Identity and Consumption scale "is a promising tool for cutting-edge ageism research, as the population grays and generational equity concerns grow more salient," the researchers wrote. "If there's one take away from this research, it's that it's important to focus on the facts of these demographic changes rather than misguided perceptions," he said. "Talking about these issues helps you find constructive ways to address them."